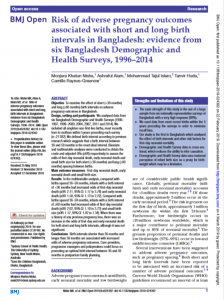 Despite improvement in recent decades, maternal and newborn mortality in Bangladesh remain high. 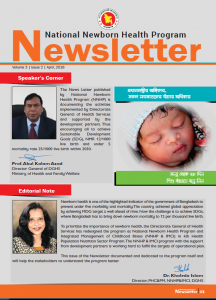 A community-based intervention package was initiated in 2009 in Netrokona, a rural district in Bangladesh, to engage individuals, families and communities to improve maternal and newborn health. 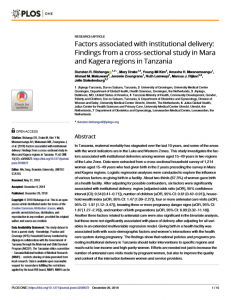 In this article, we present the effect of the intervention package on improvement of women’s capacities with regard to maternal and newborn health, their husbands’ capacities to effectively support them and use of skilled services during pregnancy, childbirth and after childbirth. We adopted a quasi-experimental design to evaluate the effect of the intervention package. A cross-sectional household survey was conducted in the intervention and comparison sites at baseline in 2014 and at endline in 2016. A total of 725 women were interviewed at baseline (intervention n = 444; comparison n = 281) and 737 at end-line (intervention n = 442; comparison n = 295). A total of 317 of their husbands were interviewed at baseline (intervention n = 178; comparison n = 139) and 731 at endline (intervention n = 440; comparison n = 291). Propensity score matching (1:1) was performed and the subsequent analysis was restricted among 235 matched women at baseline and 217 matched women at endline. Descriptive analyses were performed for the covariates for matching. 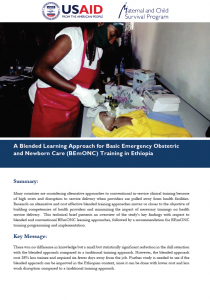 Bivariate analyses between baseline and endline were done for reporting women and their husbands’ knowledge regarding pregnancy and childbirth, birth preparedness and complication readiness practices and utilization of health services. There was significant increase in awareness of danger signs during pregnancy, childbirth and following childbirth among women and their husbands, as well as increase in awareness of rights related to maternal and newborn health. 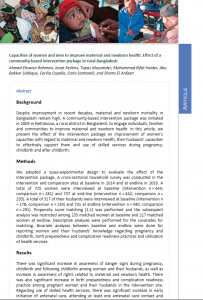 There was also significant increase in birth preparedness and complication readiness practice among pregnant women and their husbands in the intervention site. Regarding use of skilled health services, there was significant increase in early initiation of antenatal care, attending at least one antenatal care contact and attending at least four antenatal care contacts. No notable improvement was observed in giving birth in the presence of skilled attendant or use of postnatal care. 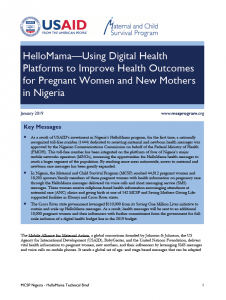 We conclude that the intervention package was effective in building the capacities of women and in engaging their husbands positively in maternal and newborn health. 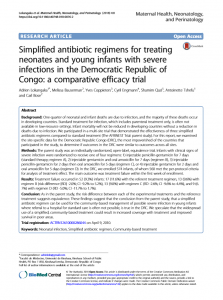 This may have translated into increased use of skilled care during pregnancy.